Earlier this week I mentioned something I really like about working in libraries. For the reference question this week, I'm going to talk about something I don't like about my job:ambiguity. And, fair warning: the next few paragraphs are just me whining, so feel free to skip to the question at the end. This week was kind of a perfect storm of annoyances for me, if you'll pardon the pun. First, it's tax season. Second, I don't know if this made the news outside of New England, but we got a bit of a storm Friday and Saturday. Most of the questions this week dealt with one of these topics. Tax forms were late this year, which always brings out the worst in people. When we finally started getting the ones people wanted and put them out for the public, people were happy - until they noticed we didn't have all the forms and instructions they wanted. Now, libraries don't create the tax forms, and we have no input into the publication schedule - we just help distribute them. We put out what we can, and for the ones we know we're missing, like the 1040 Instructions, we put up a sign saying something like "1040 Instructions have not arrived yet." Of course this prompts people to ask when they'll arrive. We have no idea. They don't know we don't know, but also rarely seem to take "we don't know" for an answer. It's a no-win situation, and one I hate to be in - I hate it when "I don't know" is really the best thing I can tell someone. It has been especially bad this year. This storm was predicted to be a big one, starting early on Friday and lasting into Saturday night. It was supposed to be so big, in fact, that about noon on Friday, Massachusetts Governor Deval Patrick issued an executive order closing all the roads in the state at 4pm, with a $500 fine if you were caught out after that. So, yeah, serious. All schools in the area were closed on Friday, and most libraries closed at noon - but not us. The way things work in my town is that it's the Town Manager's call, and his philosophy is to keep public facilities open as long as conditions allow. When we do close early, we usually only get an hour or two notice. This can cause a bit of a problem, because while most libraries announced their early closing on Thursday, Friday at noon we were still telling patrons, "sorry, we don't know how long we'll be open." It was frustrating, because the phone was ringing constantly with people asking, "hey, are you open?" and, "are you closing early?" and, again, the best we could tell them was "we don't know." This demoralized staff, but was also frustrating for patrons - road conditions were deteriorating, and they had to weigh if it was worth it to drive to the library to get books and DVDs for the upcoming snow-bound weekend. But then not even knowing if we'd be open once they got here was understandably irritating. One question I dread every winter is the "how much snow fell on X date?" We get similar weather-related questions throughout the year, but snowfall is always the toughest. The problem is there is no good local resource that provides the data the patrons want, so the best we can do is cobble together what we can find and let them draw their own conclusions. This time, someone asked me how much snow fell on two different days in January, because the plow guy she uses billed her for $60 for plowing 4" on January 16th and $40 for 1" on the 29th. Something seemed off to her, so she wanted to double-check to make sure that's how much snow was on her driveway on those days. Now that is hyper-local, and it's just tough. My favorite historical weather resource, which I've talked about before, is NOAA's snow data files, and they have snowfall and snow depth by month. The closest NOAA monitoring station is only the next town over, which is pretty good, but it's still far enough away to not be able to conclusively say what happened in her driveway on those days. The other resource I've found that's good for this type of question is Accuweather's past weather table. This is great because it easily lets you scroll backward in time, and shows snowfall in addition to precipitation (most weather resources just show precipitation, which is why snowfall is more difficult than rainfall). But a problem with consulting multiple resources is when, as in this case, the numbers don't match up. Accuweather's amounts different from NOAA's, which are themselves different from the plow guy's amounts. Not enough to dispute the bill, which I think is all this patron is looking for really. But I include this on my list of "ambiguity annoyances" because I don't like it when I can't find a solid answer for someone. I know it's the nature of research, but still - frustrating. Anyway, in this particular case, the patron also slightly annoyed that the plow guy charged her for plowing an inch of snow - but, wisely, she decided she wasn't going to say anything to him until after the major storm this weekend. I apologize in advance for this week's question - it won't help anyone, and I was trying to avoid the topic this year, but it seems like it's the only thing on patrons' minds lately. Me: Hi, can I help you? Patron: I saw all your tax forms, but there were no instructions for the 1040 - do you have any more? Me: No, I'm sorry, we haven't received those yet. We put out everything we get as they arrive, and we do expect to get some, but we don't know when they will arrive. Patron: Do you know when you'll get some? Me: No, I'm sorry, they just come whenever they're printed and shipped. I always try to tell people that tax forms are delayed this year because the tax cut extensions that were voted on in December pushed everything back. I also try to tell them that everything is available online (which most people don't care about), and that there are still months left before taxes are due, so there is still plenty of time (sometimes that elicits looks like I suggested they go kick a puppy). Patrons ask if we can call them when the instructions come in (we don't do that), and if we can post on our website when they arrive (we will do that). What bothers me the most are the people who, since they can't get what they want, take one of everything we have (instructions for the 1040A and 1040EZ), "just in case." They take a couple copies of the forms too - and I'm worried that when they do come back to get the instructions, they'll take more copies of the forms then, which will cause us to run out of things sooner, which causes us to reorder more from the IRS, which means they print more, which drives up their printing costs, which defeats the purpose of not mailing forms to peoples' homes in the first place. I'd be very curious, after tax season is over, to hear how this year's approach to tax forms went. Not mailing them to peoples' homes and getting them out late was just a unfortunate coincidence, but still, I wonder how much money they're saving, how many people will file late or incorrectly (which probably also drives up staffing costs for the IRS), and if it was worth it. And of course, the conspiracy theorist in me wonders if there's more to it: between IRS changes and changes to the way Massachusetts did tax forms this year, it really is extremely difficult for an individual to do their own taxes. I wonder if there is some powerful Tax Preparer lobby that wants to make it impossible for people to do their own taxes, thus driving up their profits and taking one more bit of self-reliance and freedom away from citizens. Hmm - seems far-fetched, but then all of my favorite conspiracies are. Earlier this week, a patron walked up and asked if we had any tax forms. I showed him where we keep the leftovers from last tax season, and told him anything he couldn't find there we could print from the IRS and state websites. No, I want the new forms for this year, so I can get an early start on them. I feel the need to reemphasize that this happened this week, specifically on September 14th (eight months and one day early!). Being asked for tax forms in December and January always seemed early, but September? Not every reference question I am asked is one that I can answer. This is one of those. Perhaps the very nature of a small public library prevents librarians like me from being experts in any given field - since we have to respond to questions on any possible topic, it helps to know a little about a lot of areas rather than a lot about a single area. Specialists work in academic and large public libraries, and generalists end up in smaller libraries. But that's not to say that a librarian won't know quite a bit about an area they are interested in. Coworkers of mine could easily specialize in linguistics, pop culture, cooking and modern fiction. Hiking, conspiracy theories, knitting and dystopian novels are some of the particular holes I've dug for myself. At least, those are all the excuses I can think of for my behavior with this reference question. I am living in Kuwait and for study purpose I have a 2 US Corporate tax related questions. A US-Based Company (Domestic Company) have its operations in Foreign Country what tax is levied on this company? If this domestic company is acquired by a foreign company (and domestic company is still operating in another foreign country)....what will be tax rate implied for that foreign country? I'm sorry, but specific tax questions are beyond our expertise here, and also violates our policy against giving tax advice. I did try looking into your request, and found the Internal Revenue Service's International Business page (http://www.irs.gov/businesses/international/), which may lead to the answers you seek. Another potential resource for you to contact is the United States Embassy in Kuwait (http://kuwait.usembassy.gov/), which may have an office to help with your questions, or be able to direct you to the government agency that can answer them. I'm sorry we are not able to answer your questions directly, but I hope some of the above information might help you. If there is anything else we can do, please let us know. Thank you, and take care. This feels like such a cop out, and I feel bad I couldn't come up with a real answer, but this seems like the kind of question someone could spend days researching and still find nothing. The patron did reply with a very polite and gracious thank-you message, but I haven't heard back if he found what he was looking for. If anyone knows of resource that can answer this, I would appreciate hearing about it. Hey, you got any tax forms yet? Since last year's display worked so well, I did the same thing again. We've been receiving tax forms since about November, but my library just got big ones last week - the 1040s, Publication 17, and the State forms. I don't know if there is any hard and fast rule as to when libraries can put out tax forms, but since patrons have asked me about ten times every hour all week, I decided today was the day. Also like last year, as part of our tax assistance offerings, we plan to have an AARP Tax-Aide volunteer again, but that hasn't been scheduled yet. Better him giving tax advice than library staff. 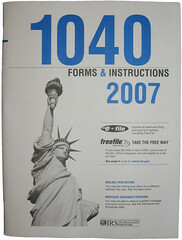 I guess the only surprise this year was the fancy new cover for the 1040 instruction booklets. It certainly looks nice, but I wonder how many thousands of tax dollars went into designing and producing that. Happy tax season to all. A patron called my library's Director and said she wanted to donate money to the library. However, she said she could only donate to 501(c)(3) organizations. My library is a department of the Town's municipal government, and has a trust fund, but our Board of Trustees had voted not to apply for 501(c)(3) status, as it is a tremendous amount of paperwork. So, my Director asked me to find some kind of documentation stating that this patron could in fact donate the money to the library, and still write it off as a donation. The first thing I tried was a Google search of the IRS website for "municipal donation site:irs.gov." Among the matches were the IRS' Publication 17 [pdf], Your Federal Income Tax, and their Publication 526 [pdf], Charitable Contributions. Generally, only the five following types of organizations can be qualified organizations. 1. A community chest, corporation, trust, fund, or foundation organized or created in or under the laws of the United States, any state, the District of Columbia, or any possession of the United States (including Puerto Rico). It must be organized and operated only for one or more of the following purposes. Okay, "local government...for public purposes" - that's pretty clear. I still maintain that librarians should never give tax advice, but I copied that and gave it to my Director. You cannot deduct contributions to organizations that are not qualified to receive tax-deductible contributions, including the following. Chambers of commerce and other business leagues or organizations. Country clubs and other social clubs. The one that caught my eye was "Communist organizations." I thought it odd to single them out, especially since "Political organizations and candidates" is also listed. Commies can never catch a break.